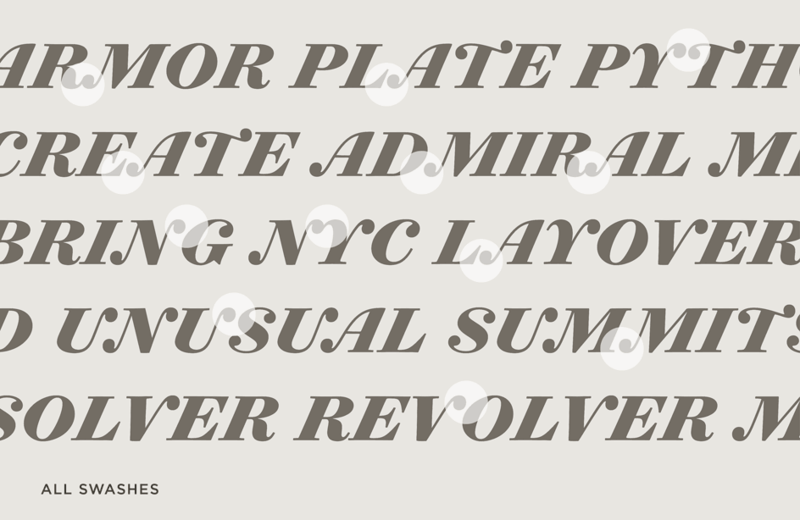 Surveyor Font Features: Smart Swashes | Hoefler & Co.
Surveyor automates the way its swashes are deployed, to help improve both the rhythm and voice of your typography. While swash caps are most commonly used as initials, when setting upper- and lowercase, Surveyor’s swashes can perform in the middles of words as well. Using swashes throughout a paragraph can charmingly transform both its tone and its texture, provided they’re applied with care: swashes that collide with their neighbors, or force unwelcome spaces, will quickly disrupt the rhythm of the text. And using too many swashes can be both distracting and saccharine. To make it easier for designers to set entire paragraphs with swashes turned on, Surveyor includes a set of rules that automatically govern when swashes should appear, and how often. Gestures that entangle other letters are eliminated, as are ones that cause gaps in the text. Where two swashes meet, preference is given to the one that delivers the most flavor, with the fewest consequences for spacing. When the same letter appears more than once in a word, an additional set of rules determines whether both instances should be swashed or not. Designers can override these features by picking swashes from the glyph palette, or activating one of Surveyor’s stylistic sets in applications that fully support OpenType. Optical Sizes. To preserve the typefaces’ delicate features, each of Surveyor’s styles is provided in three different versions to tackle different size ranges. Smart Swashes. Surveyor’s swash caps and swash small caps feature built-in intelligence that helps automatically improve the rhythm of text. Stylistic Sets. Surveyor uses an advanced feature of OpenType-savvy applications, allowing designers to transform the look of the font with a single click. Numerics. For tables and charts, Surveyor Text and ScreenSmart include a “Numeric” range that contains tabular figures, fractions, and extended symbols. Language Support. Surveyor features our Latin-X™ character set, covering more than 140 languages throughout the world — including all of Central Europe.